Join the Fredericksburg Theater Company as they celebrate another season. 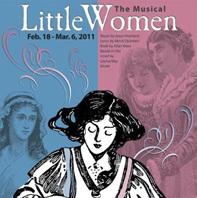 FTC’s production will be “Little Women: The Musical”. Based on Louisa May Alcott’s beloved novel, this exhilarating musical follows the adventures of the sisters Jo, Meg, Beth and Amy March as they grow up in Civil War America. All performances are on Fridays and Saturdays at 7:30pm and Sundays at 2:00pm at The Steve W. Shepherd Theatre, 1668 Highway 87 South. Tickets are $20 for adults and $5.50 for youth 18 and under, and can be purchased on line at the FTC website.